Looks for the presence of IgG and/or complement on the RBCs. This causes hemolysis and can be due to an autoimmune disease, transfusion reaction, etc. This is used when cross-matching people for a blood transfusion. 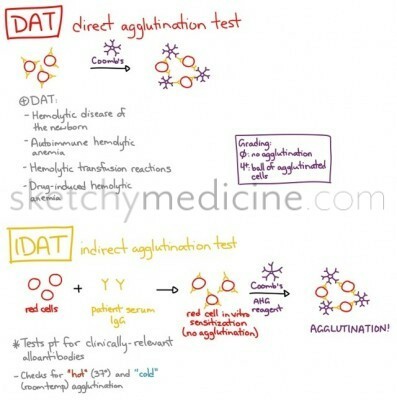 It tests patients for the presence of unexpected alloantibodies (anti-D, anti-E, anti-C, anti-Kell, anti-Duffy). This is just a screen, if it is positive, you can then test for specific antibodies and then only transfuse blood that is negative for those specific antigens. 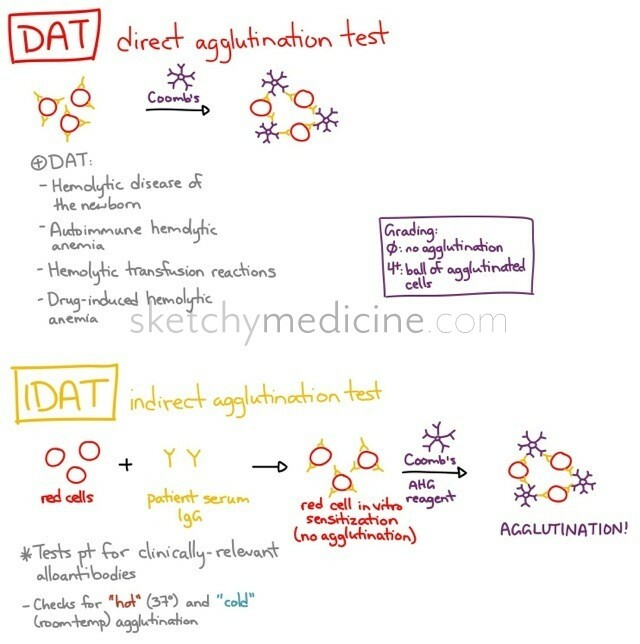 * 19/06/2013 Please excuse the doodle for saying “agglutination” though it is testing by agglutinating, the “A” in DAT stands for antibody. Thanks Robina for pointing this out! This entry was posted in Heme, Obs/Gyn and tagged Blood work, prenatal by Ali. Bookmark the permalink. Thanks! You are totally correct!